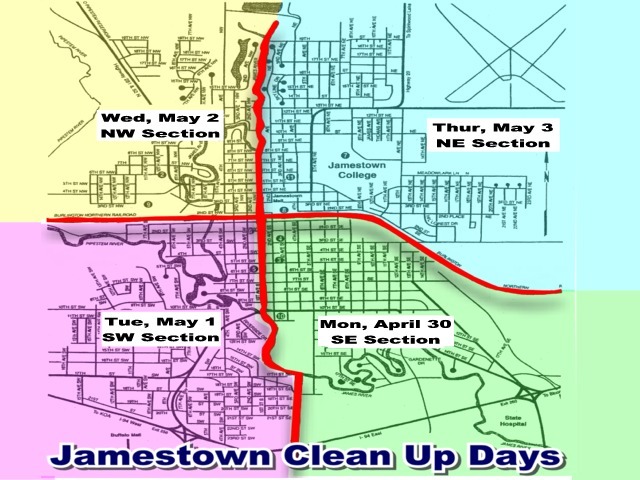 Jamestown (CSi) Jamestown has set this year’s City-wide Cleanup for April 30-May 5. City crews will collect discarded and unwanted items curbside only, at no extra charge. Cleanup Week includes occupied residential dwellings. NO commercial, educational or religious buildings. Place materials that WILL BE picked up ON THE ROADWAY as close to the curb or shoulder as possible, by 7-a.m., on your pick up day…NO SOONER THAN TWO DAYS AHEAD OF THE SCHEDULE. Tree Branches…less than three feet long, less than two inches in diameter, tied in bundles, not weighing more than 50 pounds. Furniture, toys mattresses etc. Place in neat, separate piles of similar materials. Wood Lumber, carpet and padding, wall board, tile, tubs and sinks, doors, windows, gutters, fencing, non-creosoted landscaping timbers, brick pavers, Etc. Small scale means the approximate volume of a level pickup truck bed. Place in neat separate piles of similar materials. Appliances…stoves refridgerators, freezers, air conditioners, dehumidifiers, water heaters, and other items that use Freon. Electronics…t.v.s stereos, computers, computer monitors and microwave ovens. Automotive products…antifreeze, 6 & 12 volt lead-acid batteries, any tires. Automobiles, boats, large-scale building, remodeling debris. Paint, solvents, thinners, primers, varnishes, and stains. Power lawnmowers, propane tanks, and gas cans with gas in them. Bio-medical waste…sharps, or anything contanminated by human blood. Metal items…unless a part of a material that will be picked up. 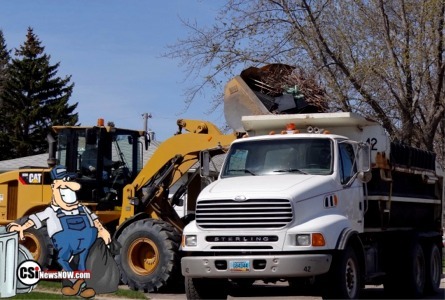 During Cleanup Week, the city baler will be open from 8-a.m. to 6-p.m., Monday through Friday and 8-a.m., to 12 noon Saturday…show proof of city residency such as a utility bill or valid drivers license. Also available is Gerdau Ameristeel, West End Hide and Fur, Central Valley Health, Jamestown Regional Medical Center. Pick up paint by looking through the REUSE AREA at the City Baler, if you find something you can use, take the material home at NO CHARGE. 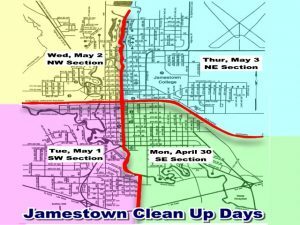 The Jamestown Area Chamber of Commerce/City Beautification Committee encourages groups or individuals to help clean up public areas in town, organize you group to do your part in cleaning up Jamestown.